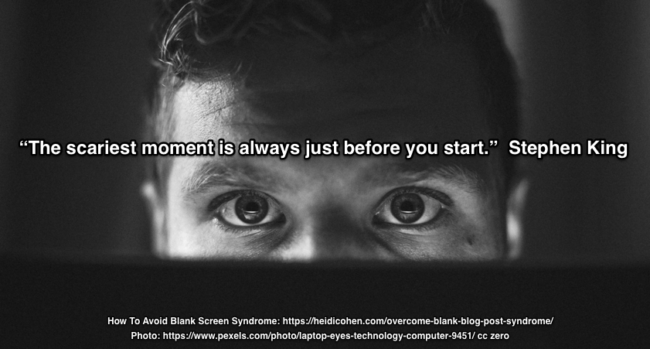 Have you ever sat staring at the blinking cursor on your blank computer screen wishing words would magically appear? While planted in your seat you hear the nagging voice inside your head scolding you. It sounds eerily like your third grade teacher Mrs. Barry. So much so that you see her eyes narrow as she wags her pointy red polished forefinger at you. With these words echoing inside your head, you trudge off to the kitchen for more sugar-fueled coffee and snacks. But alas with your deadline still looming your computer screen remains void of words. It’s what writers, bloggers, content creators and other creatives fear most. Stephen King Quote reveals blank screen syndrome is real! I call it “Blank Screen Syndrome” or BSS for short [AKA: Blank Page Syndrome or Blank Blog Post Syndrome]. 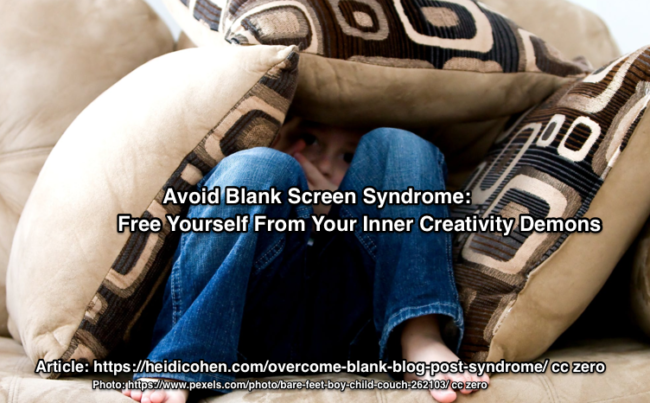 While not a recognized medical condition, Blank Screen Syndrome is a very real problem. Worse yet, it has an uncanny ability to strike at the most inconvenient times, namely when you’ve got a deadline looming. 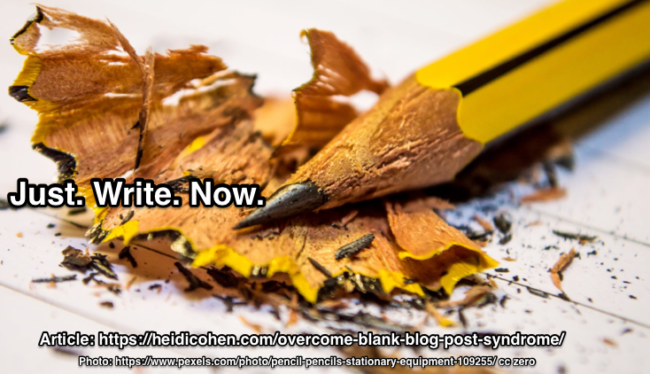 The good news is that you can cure Blank Page Syndrome. But there’s a catch: You’ve got to put in the hours needed to do the work to build your creative muscles and resilience. Being a writer or other creative requires that you show up at the page every day. Even better, King kept every one of his rejection letters on a big hook near his desk as a badge of honor. Rather than hold him back or discourage him, these physical letters were tangible evidence of his progress as a writer. Adopt a growth mindset to transform and fuel your failures into your future growth by continuing to persistently show up at the blank page despite your fears. To break out of Blank Screen Syndrome, here are 5 techniques to build the creative habits to you need to support your art. Comedian Jerry Seinfeld uses his “Don’t break the chain” process to develop better jokes. Like other forms of creative activity, he writes jokes everyday. To pressure himself to write, Seinfeld hangs a giant wall calendar of an entire year’s worth of dates on one page in his office. After doing his daily writing, he marks a big red X across every day. These red Xs form a chain. Break your writing rituals. 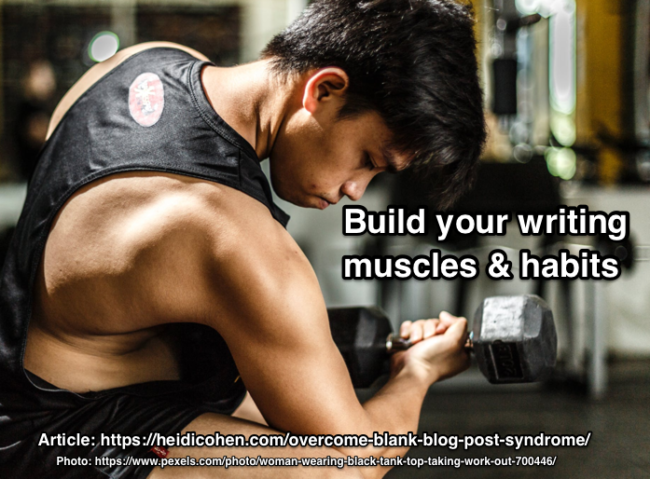 To tap into your creative muse whenever necessary, occasionally test using other writing environments. At the heart of creativity is a child-like wonder that allows us to get immersed in problems away from the pressures of our daily routines and work. John Cleese cites University of Sussex’s Professor Brian Bates’ research in his talks on creativity. Using architects, professionals dependent on both creative and analytical skills, Bates found that the more creative architects recreated a childlike approach to thinking that’s connected to the unconscious. This may be why many accomplished writers incorporate a walk in nature into their daily routines. When I studied with Poet John Yau, he forced us outside of our writing comfort zone with assignments that set unusual constraints, a key element for creativity. Schedule unplugged time to allow your brain to play. Be alone with your thoughts, preferably in nature. Give work teams space to avoid forcing creative decisions. Even if you’re up against due dates, create an illusion of time to think. It worked for Hitchcock. Set constraints on your work to fuel creativity. Be like John Yau. Find creative approaches that work for you. Test new writing methods to improve your output. But don’t sacrifice quality for quantity. You don’t need a therapist to stop listening to your inner creative critics whether it’s family members, teachers, or even your BFF. Start by understanding that everyone has an inner voice that rattles on constantly. Unfortunately your inner voice is often your worst enemy because it tends to be hypercritical. Since the voice is inside your head, no one talks about it for fear of looking crazy. 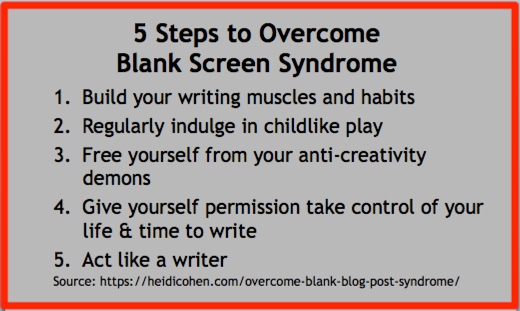 To help, here are 7 steps to overcome writing demons. Use morning pages to get these toxic inner conversations and criticisms out of your head onto paper or screen. As a result, your brain’s able to focus on being creative. Morning pages deal with your inner thoughts, not your writing. Don’t stop to think or edit while you’re moving these words out of your head. Write “Morning Pages” every day. Have a notebook or document file where first thing every day you transcribe everything that’s in your mind. Do this first thing while you’re still in a semi-dream state without editing, correcting or reading it. Use positive self-talk. Until you’re able to squash your non-stop inner critic, tell yourself that you’re a creative person. If necessary, place post-it notes in visual range of your desk or computer. You can’t just dream about wanting to be a writer or other creative type. You must take responsibility for your life and find the time to do it regardless of your other time constraints and commitments including work and family. If you want to be a creative, pay yourself first by practicing your art regardless of what you have to do to make the necessary time. I committed to writing when I was working full time at Citibank. To have time I woke up an hour before getting ready for work. Similarly Andy Crestodina is using an early morning writing routine to update Content Chemistry. Further, I took courses in Manhattan and spent my vacations at writing retreats to improve my skills. To draft his first book, Can We Do That? Peter Shankman took a non-stop flight to Tokyo to have an uninterrupted writing time on the plane. Author (link to affiliate page) Mark Schaefer dedicates concentrated periods of time when he’s not traveling to writing books. Schedule time to write every day. Treat writing time as a sacred appointment. Test creative retreats. Learn and be with other creative people. I invested my vacation time in writing retreats. Have a detailed outline and a schedule for unstructured writing time. Consider your writing insurance policy. Participate in National Novel Writing Month. It helps by setting constraints. In today’s information-rich environment, practicing a creative art is challenging since you need to reduce your outside stimulation including screen time with computers, smartphones and televisions. Indulging in couch potato activity dulls your brain. While the moving figures stimulate your mind, they give you a false sense of activity. Instead invest in yourself—feed your mind by reading. This approach made Warren Buffet successful. Read widely and daily. Go beyond the latest news and business books, study literature. Capture fleeting creative ideas before they vanish. Don’t depend on your brain to remember them because it thinks that it’s finished its work. Instead jot down or dictate notes when you have the ideas. Develop what Cal Newport calls “Deep Work”. Schedule time for focused work into your weekly plans. 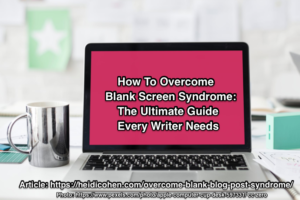 Don’t let Blank Screen Syndrome (BSS) immobilize you! 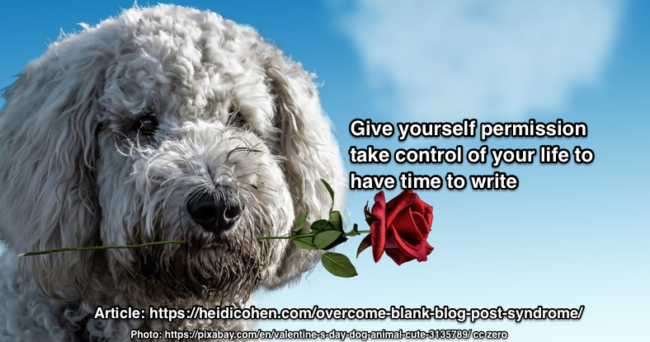 Instead take control of your time and your life to become the writer or creative you want to be. This isn’t pollyanna platitudes. 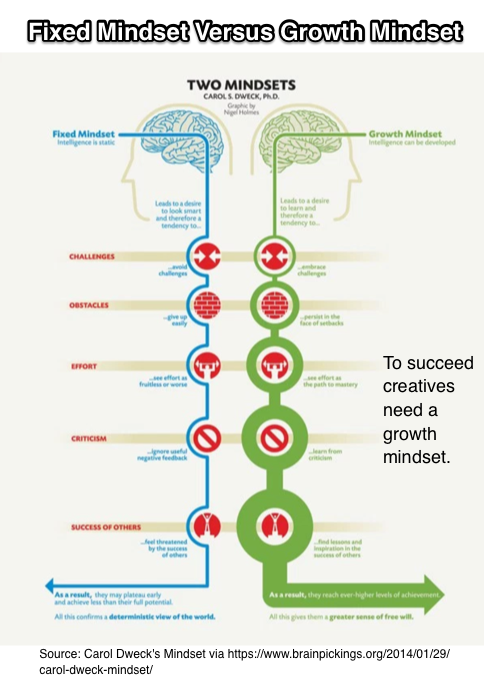 Adopt a growth mindset to create content based on building your creative muscles and habits due to constant practice. Fail faster to learn how to become more creative. After stifling your inner critic, stop using creative approaches associated with painful memories. Unlike your third grade composition where you had to start at the top of the blank page, you’re free to start anywhere. Start writing where the energy of your ideas are and let them flow. Take a page from Hollywood where movies are filmed to minimize actor time on location. While you’re at it, stop romanticizing your all-nighters! Instead get at least 8 hours of sleep so your brain can do its creative work. Trust that over time you’ll develop a process that works for you. Go on become the best creative person you can be. Give yourself permission to bloom. Editor’s Note: This article has been significantly expanded and updated. It was initially published on October 26, 2010. Tags Andy Crestodina, Ann Handley, Blank screen syndrome, Blogging, BSS, Cal Newport, Carol Dweck, Creativity, David Ogilvy, Jerry Seinfeld, John Cleese, John Yau, Mark Schaefer, Mark Twain, Peter Shankman, Ryan Holiday, Stephen King, Thomas Edison, Warren Buffet. Bookmark the permalink. Thanks for all the great information. I have so many friends who don’t want their own blogs, but they want blogging experience. I will definitely pass this on. Thanks for sharing, really nice. Thanks for your advice Heidi. Your penultimate paragraph particularly resonates with me. I’m still a novice blogger and I have found a writing style I never knew I had through blogging. When I think of something I really want to share I start writing where the feelings and energy are. It feels like something jumbled up in my head that I want to explore further. Part way through it seems to be unravelling like a piece of knitting coming undone (not sure if this is going to come together as I’d like) and I find myself rapidly trying to gather up any dropped loops (thoughts). Often at this stage certain sections don’t really make sense but, as you say, it’s okay to go back and alter it over and over until you’re happy with it. By the time I reach my conclusion I feel like a circle that has been round and reached the starting point, although I don’t always end up back where I started! I’m still nervous about posting so I run it all past my husband in case I have inadvertently said something daft. He is always positive and if he criticises my blog he has a sensitive manner about it which is increasing my confidence. For anyone feeling apprehensive it is worth finding someone you trust who is supportive to read through posts until you are comfortable posting. I appreciate all this useful information.